Wouldn’t it be awesome if someone offered a really good website, flyers, business cards and artwork package deal for small and new businesses? Hurry to make use of this unbelievable deal. 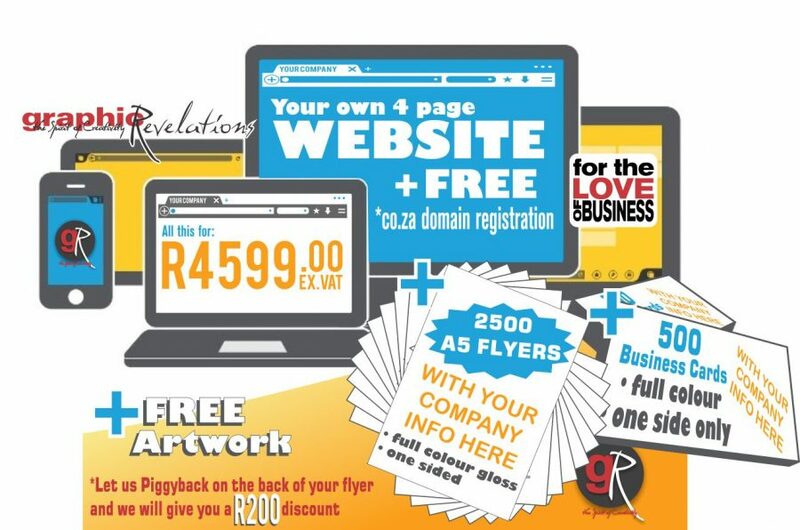 For only R4599 you get you own .co.za domain (mycompany.co.za) with your own domain based emails (myname@mycompany.co.za) PLUS 2500 gloss flyers PLUS 500 FREE business cards PLUS we’ll even throw in the artwork completely FREE of charge. To top it off, if you let us piggyback on the back of your flyer, you get a R200 discount! Can you afford not to make use of our website, flyers, business cards and artwork package?